Book lovers unite as we welcome former Tampa Bay Times reporter, Jeff Klinkenberg to get his take on what every bookcase must have. While many authors have called Florida home, some truly define our state’s literary heritage. 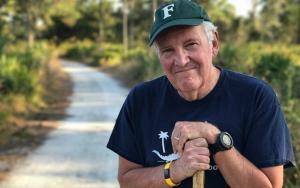 Jeff Klinkenberg will discuss some of his favorite “Florida books”, working his way up from William Bartram in 1791 to Jack E. Davis in 2017 with a few favorite authors - Zora Neale Hurston and Patrick Smith - in between. Whether you’re a 5th generation Floridian or a transplant from Michigan, there’s something for everyone. This is a free event but registration is required. The lecture will be held in the Historic Alcazar Pool, which is handicap accessible. Guests may enter through the Cafe Alcazar Granada Street entrance, located in the back of the Lightner Museum. Doors open at 5:00 pm, with the lecture beginning at 5:30 pm. Reception and light refreshments to follow. This program is sponsored by the Florida Humanities Council with funds from the Florida Department State, Division of Cultural Affairs and the Florida Council on Arts and Culture. Additional support has been made by The Historic Inns of St. Augustine and St. Johns County Tourist Development Council.